Guest satisfaction is the greatest reward for The Adnyana Villas & Spa. Accuracy as well as the hospitality of our staff will be always bring comfort to our guest during they stay at The Adnyana Villas & Spa. Holiday at The Adnyana Villas & Spa is the an unforgettable experience, among Balinese people life, see and fell all around its make guest are not only just stayed even float in the rhythm of Balinese culture. Armed only by honesty, The Adnyana Villas & Spa are perfect for resting and relaxing place for families or couples. Amenities of the house include complete communications facilities, satellite television, DVD, audio system, and multiple living areas. The Adnyana Villas & Spa is looked after by a large household staff that strives to cater for every whim or desire. Welcome by a huge gate directly first step to villas & spa with the smile of our staff polite will always hope this is most beautiful memories for our guest and see them to comes again. Meets and greets guests on arrival, leads the staffing team to meet the expectation of each guest. In charge for housekeeping and laundry. Trained in local cuisine and in charge of market shopping and meal preparations. On-duty to ensure the safety and security of the guests and the area. Work discreetly to maintain the landscape and the pool without distracting the guests. ach of our villas is set within a private walled garden, complete with its own private pool or alternatively a plunge pool with a hot water facility. Furthermore, each villa presents an outdoor living and dining pavilion, a stylish bathroom with bathtub and shower. Air-conditioned bedrooms complete the picture. Each is equipped with a LCD satellite television, iPod and sound dock, safe deposit box, and a thoughtful array of amenities for your comfort and convenience. 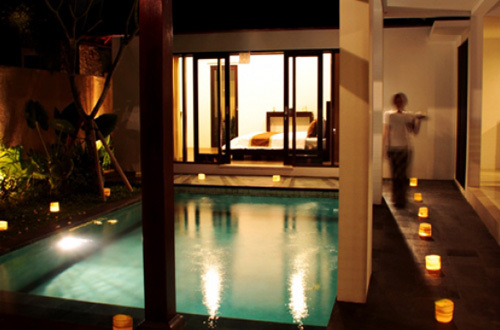 The Adnyana Villas have 2 bedrooms in each villa, consists of the main room and second room for guests or children. The Adnyana villas also equipped by a living room to relax, the main bedroom was directly in front of a private swimming pool with gazebo for enjoying leisure time. Behind the villa there is a large garden overlooking the rice fields to accompany coffee time, let the children play in the garden which will be supervised by staff of The Adnyana Villas. The distance to The Adnyana Villas is not far away from Ngurah Rai International Airport. Approximately 20 minutes drive.